Hundreds of schools across the country have helped us build homes and sanitation units for low-income families. These activities instil a sense of compassion and generosity in students. The Rupee For Change (RFC) initiative engages students in numerous ways to help provide people a decent place to live. These are poster making competitions around the themes of housing and sanitation. The competition has a small mandatory participation fee, and any additional donations by friends and family members. All proceeds go towards Habitat’s program efforts. Students can choose what they want to read, set themselves a challenging goal and ask their parents to support their eff­orts to meet this goal by sponsoring them. Schools can participate in various marathons to raise funds for Habitat’s program efforts across the country. Students can contribute Re.1 per day towards building homes and providing sanitation facilities for those not as fortunate as themselves. Schools can participate in programs to volunteer to build Habitat homes for families across India. 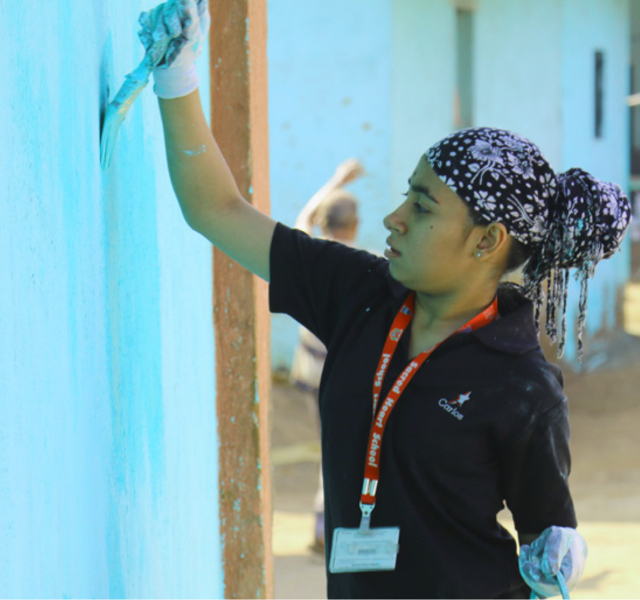 Held annually over a period of four months, HYLB brings together youth across the entire Asia-Pacific region and around the world to support families in need of decent housing. HYLB members participate in volunteering and fundraising activities. They also advocate for decent homes and sanitation facilities as ways out of poverty and towards self-sustainability. Schedule an introductory meeting with our Partnership team. Once you submit the form, a member from our team will reach out to you via e-mail within 3-4 working days to schedule a suitable date and time for the meeting.